Finish with a beautiful shiny black color, the feet of storage space in labor with a beautiful gold color and captivating. For the beauty of the bathroom decor, and more and add nuance of luxury, equipped with lights flashing at the wall with a soft, helped change the atmosphere becomes more romantic. These vanities complete with an oval mirror that is designed against the bathroom wall. 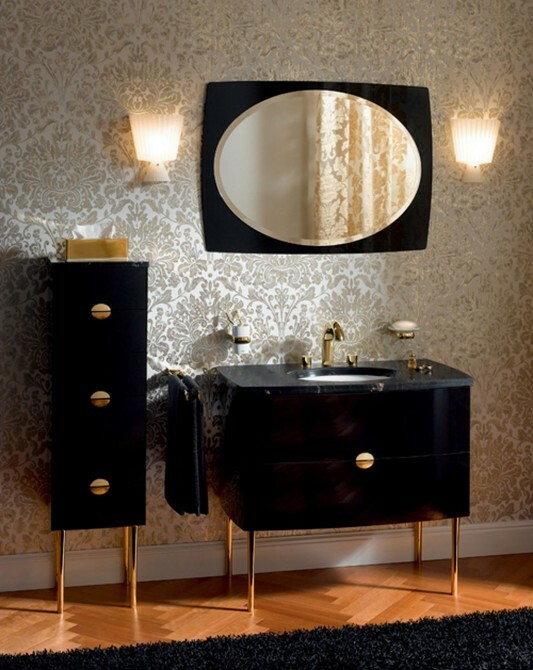 The combination of gold and black color on the bathroom vanities this classic style, looks so harmonious, creating a contemporary bathroom furniture with a design of luxury. To see detailed room vanities, you can visit Robern.